Improving the speed that you can change chords is often one of the biggest turning points in learning the guitar. Without the ability to execute fast chord changes playing a song just won’t sound fluent, and it hardly needs to be said that learning how to play songs is one of our greatest motivators. Developing muscle memory for your chord shapes is an essential skill in playing the guitar. Even though there are some specific challenges relating to chord changes (addressed in later sections), we start building muscle memory from the moment we learn a new chord. In order to make any significant progress on improving your chord changes, you’ll need to develop your muscle memory. Muscle memory is a skill that you already possess, and you can see it in your every-day life. Try reaching out to pick up a glass slowly and you’ll notice that your hand takes on the approximate shape of that glass before you actually touch it. Learning chords on the guitar works in the same way. A professional guitarist can change between chords quickly because their hand already knows the shape of the chord and assumes that shape before it arrives on the fret board. Most people assume that a professional guitarist changes chords smoothly by moving their fingers at high speeds, but in fact, if you watch a guitarist play, you’ll notice they move at a very modest pace. Once your hand knows the chord shapes, you’ll be able to move all of your fingers simultaneously instead of one at time which will enable you to move to the chords faster. These techniques are all about changing the way we practise. Up until now you’ve always put your fingers on the guitar one at a time, which is an acceptable compromise when first starting to learn how to play chords. The following exercise advances your skills to the next level by practising moving all of our fingers at once. While holding an A chord, squeeze your fingers tightly against the strings and then without taking your fingers off the strings, release your grip just enough so that the strings come away from the frets. Normally your hand is only able to hold the correct shape by applying pressure to the fret board. By repeating this exercise, you’re teaching your muscles how to hold the shape without applying pressure. By staying in contact with the strings, you’re helping your hand maintain the shape, like learning how to ride a bike with training wheels. For muscle memory to form, you must practise squeezing and releasing as many times as possible. We recommend at least thirty repetitions per chord in your vocabulary at each practice session. 3. Release the pressure in your fingers, allow the strings to lift off the frets but keep your fingers in contact with the strings. While holding an A chord, lift your fingers just above the strings while still maintaining the shape of the chord in your fingers. Now drop all of your fingers back down into place simultaneously so that you are holding the chord normally. Repeat this exercise over and over increasing the distance that you lift your fingers from the strings each time. If you are unable to drop all of your fingers down at once, then start again at a distance that you can manage without making a mistake. This is like practising your chords in reverse, and the advantage is that your fingers are learning how to move to and from the shape simultaneously. Practise this exercise with all of the chords in your vocabulary at least thirty times at each practice session. Now comes the tricky part: putting all of the skills you’ve learnt together! In order to play songs, you’ll need to hold a chord, strum a basic rhythm, then change to a different chord smoothly, and continue the rhythm. 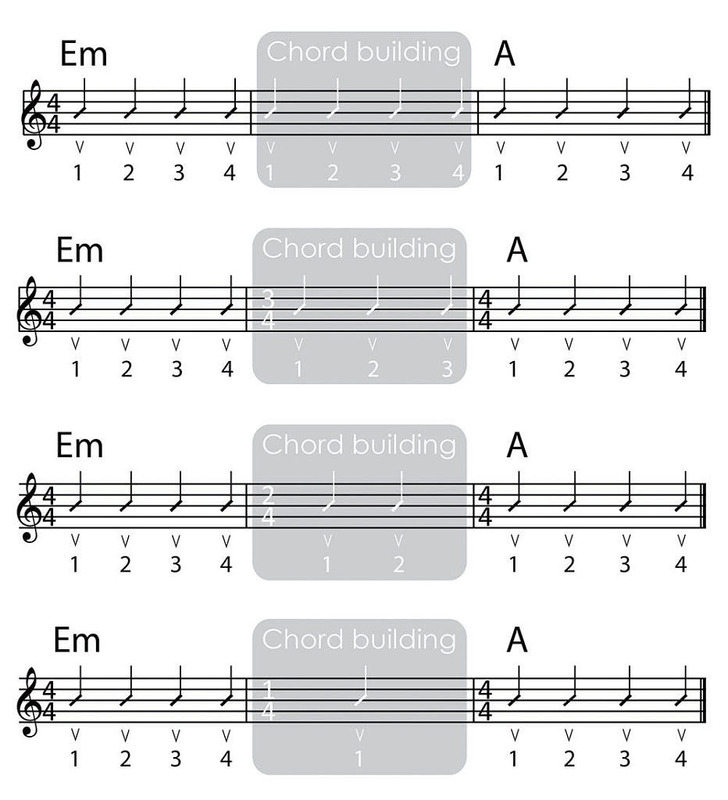 Take a look at the exercises below, displayed are two bars of rhythm, and each bar has four simple down strums in it. Over the first bar you can see Em indicated, meaning you must hold the Em chord while strumming the first bar. Skip over to the last bar and an A is indicated which means we must change to an A chord in time for the first strum of this bar. In between the bar of Em and A, you will notice a bar which is shaded out with Chord building written above it. This is an additional bar that has been introduced to give you more time to change between the chords. The goal is to continue strumming in the Chord Building bar while performing the chord change, and have the A chord in place for the first strum of the last bar. Most importantly, you must keep the beat, and therefore the strumming must remain consistent and uninterrupted as you play the exercise. It won’t take long before you can perform this chord change in the four beats alloted. Keep in mind, it is important to have the A chord shape in place in its entirety at the beginning of the bar marked with an A above it. As you move through the exercises you will notice the Chord Building bar has been reduced to just three beats, in effect forcing you to improve the efficiency of your chord change. It’s important to play all of these exercises at the same speed to ensure you don’t make the exercise harder than necessary. Each of these exercises continues in this pattern, steadily decreasing the length of time you are given to change chords until you have just one beat left. If at any point you find yourself unable to meet the challenge, return to your routine of practising Muscle Memory for a while before trying again or take a break and start again later. The key to mastering your chord changes is to start changing early enough to arrive at the next chord in time. The diagram below outlines one bar of Em and one bar of A. When first starting out, most students tend to play the whole bar of the first chord, stop playing while changing to the second chord and then complete the exercise. The method of anticipated chord changes teaches us that it is more important to play the first beat of the second chord in time, than it is to hold down the first chord for the entire bar. With this knowledge in mind, you can now start planning to change from the first chord early enough to arrive at the second chord on beat one. Start strumming through the exercise as normal, but once you reach beats three and four, start executing the chord change early (while still strumming) so that you have the next chord in place for beat one of the next bar. At first, some of your strums may sound a little clumsy as open strings are mixed in while you change chords. However, this improves significantly with practice. A professional guitarist, for instance, uses only a fraction of a beat to make this change. We recommend you use at least two beats to make your chord change initially, and, as you become more proficient, you can reduce the time you’ve allocated for changing chords. Once you master this technique, you can apply it to make your basic songs and exercises, making them sound smoother and more musical. Additionally, you will be learning the most important element about chord changes: learning how to make a chord change in time with the music. Let’s practise this concept as indicated in the diagram below. You can think of the anticipated chord change exercise as being fairly similar. You’re still using approximately two beats to perform the chord change, but instead of doing this change in between the bars you will be doing it at the end of the first bar. If your strumming hand stops when you change chords early, have a friend or teacher count the beats for you or call out keep strumming as you reach the beats where you will be changing chords. If you arrive too early at the next chord then you may need to decrease the amount of beats you’ve allocated for changing chords. Learning exactly how long it takes you to change between chords at different tempos is all part of the process for this exercise.